Through the course of the recession, one solid truism has been that fast food restaurants like McDonald's (MCD) should benefit from dire economic circumstances. 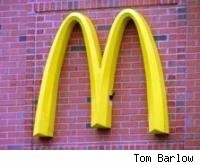 As customers become more cash-strapped and short on time, the iconic golden arches offer meals that are simple, quick and cheap. Perhaps just as important, McDonald's offers a familiarity that is extremely comforting. In many ways, the chain's Q2 earnings bear this out. McDonald's had a 4.8 percent jump in global comparable sales, with a 3.5 percent increase in the US and a 6.9 percent increase in Europe. Earnings per share were $0.98. Part of the company's strategy has been to draw in downward-drifting consumers with semi-healthy, gourmet-esque offerings like chipotle and honey mustard snack wraps. Interestingly, it has also sold its interest in premium fast food chain Pret A Manger. It seems likely that Pret's potential to compete with McDonald's, combined with the fact that the chain's interest was non-controlling, made the sale seem very attractive. Although the recession has spurred McDonalds' growth, the strong dollar has seriously undermined its profits. The company experienced $0.09 per share of negative impact from foreign currency translation, and has seen its revenue fall seven percent, to $5.65 billion, from last year's $6.08 billion. This problem is even more pronounced when extrapolated over the first six months of the year, in which the chain's revenues of $10.7 billion represent a drop of over a billion, or eight percent, from last year.